This dress personifies elegance and grace and the abstract pleated colors showcase “must have” colors on spring dresses. From the cross-strap detail to the pleated silhouette, the dress is a show stopper which is probably why I couldn't take my eyes of it when I saw it online...definitely a must-have! I was lucky to get it when it went up on sale weeks ago and I wore it during Easter as shown on my Instagram. This dress will be great for spring graduations or wedding events and you can dress up in heels or casually in flats. I will be packing this dress for my next vacation with some amazing flats. 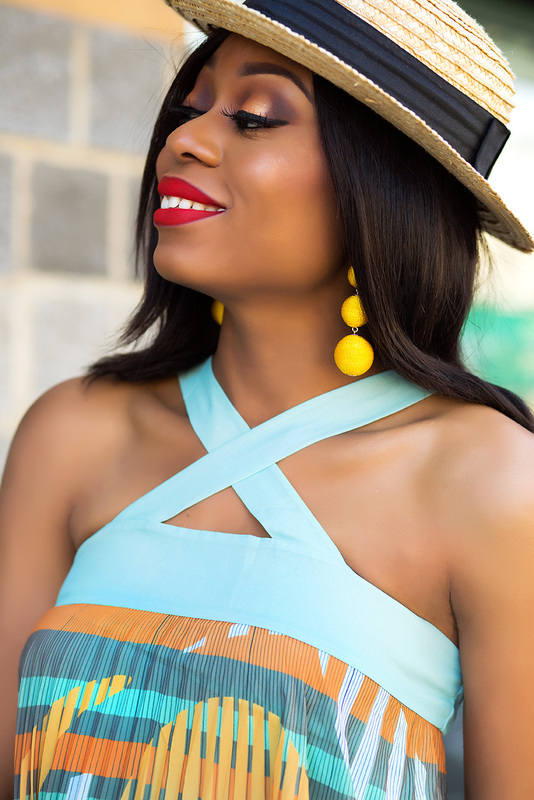 I completed the look with the "It bag", yellow earrings to complement the dress and straw hat for fun. Do you buy these dresses,shoes, etc or the brand sends them to you? do you think this dress is wearble in the fall? like sept?